For great friends, great weather, and 2 healthy feet that have been treating me to many great adventures lately! Thanksgiving morning, I went on a road ride with Dan & his dad, before feasting that afternoon. Friday, Rebecca and I hit the new Raccoon Mountain Trails on our our mtn bikes. 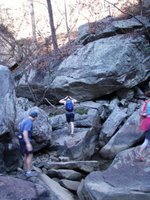 These trails are only about 30min west of downtown Chatt! The local SORBA chapter has really done an incredible job up here - there will be lots of trail building throughout the winter and I hope to catch up with them and give a little back. The trails aren't too technical and should be good to work out some of my bad habits. Saturday was reserved for catching up on work, cleaning, yard work and good football! 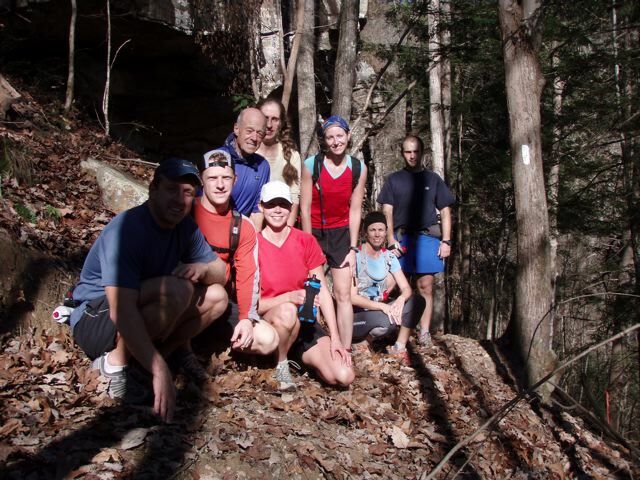 Sunday I met up with the running crew for another long one on the Cumberland Trail. We actually did the same Soddy segment as last weekend, but I still took my camera for some new pics. Unfortunately we still couldn't find a way across the creek, even though the water was down a good foot. At the end, we did a short preview of next section (Possum Creek Gorge), to bring our mileage total to approx 20. I'm feeling pretty good running and should hopefully be fairly prepared for the upcoming ALTAR.